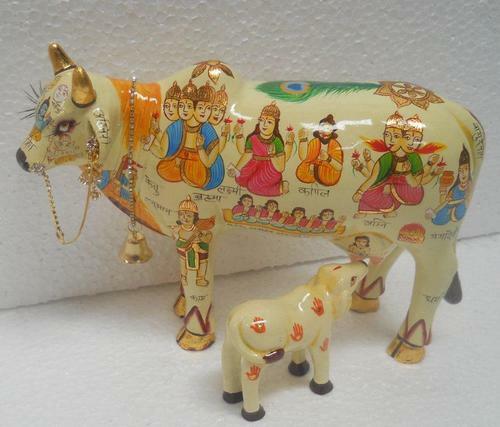 "Kamadhenu (kama-dhenu, 'wish-cow'), was a miraculous cow of plenty who could give her owner whatever he desired. She was sometimes said to be the daughter of Daksha, and the wife of the rishi Kasyapa. 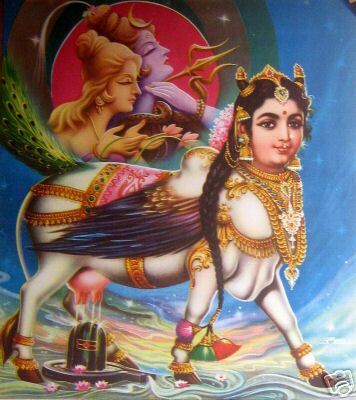 Kamadhenu appeared on earth as one of the precious things that were brought to light in the Churning of the Ocean. The gods presented her to the sapta-rishis and she became the property of the sage Vasishtha. The Ramayana relates that the sage Visvamitra once paid a visit to the hermitage of Vasishtha and was received and entertained with great hospitality. 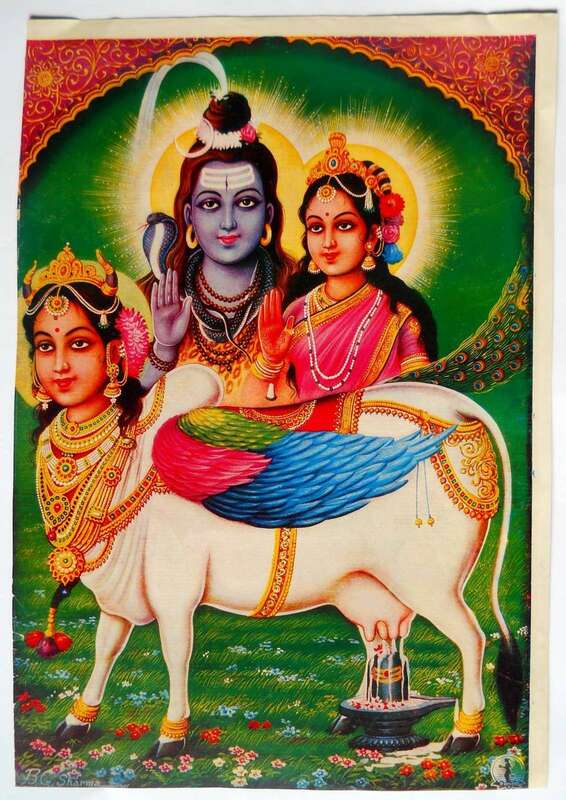 At the hermitage he saw the priceless Kamadhenu who had provided all the delightful things for the repast he had just enjoyed, and he was filled with covetousness for her. 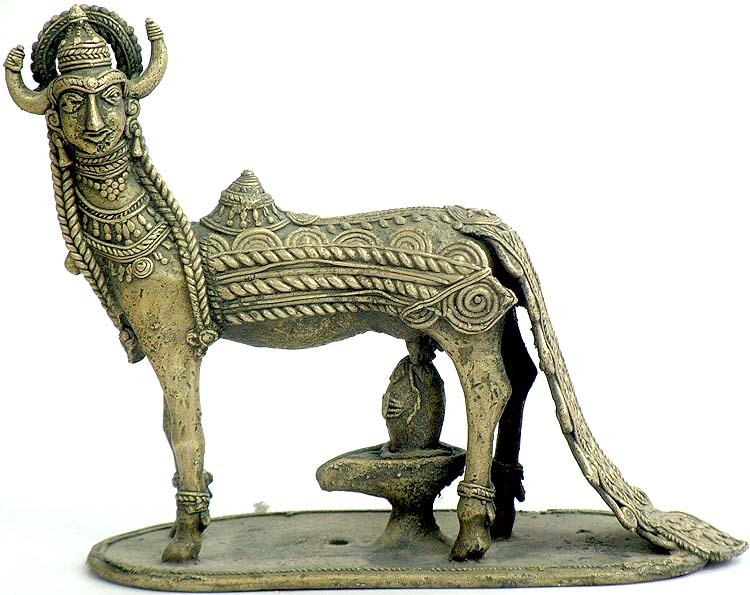 He offered Vasishtha all he owned for the cow but the offer was declined. He then attempted to take her away by force but Kamadhenu broke away from his grasp and magically conjured up warriors to defend herself and her master. Visvamitra next summoned a few hundred of his sons to battle for her, but Vasishtha reduced them all to ashes with a hot blast of rage from his mouth. In the long and fierce struggle between Visvamitra and Vasishtha the former suffered a humiliating defeat and for this reason resolved to become a brahmin on his own merit and so equip himself for equality with his brahmin rival. 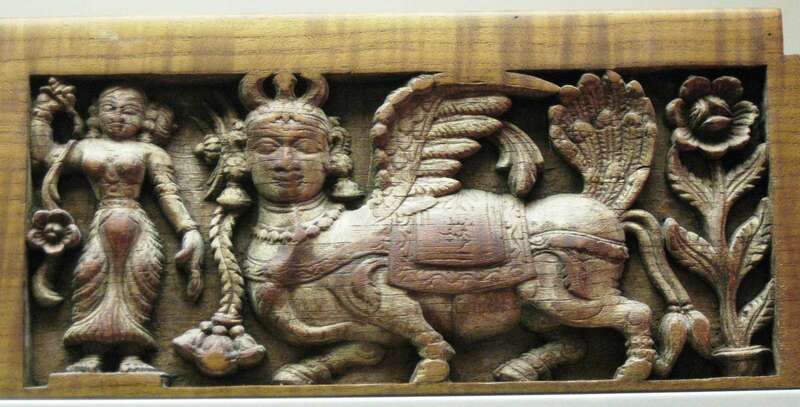 In another legend Kamadhenu was killed by the exiled king Trisanku to provide food for the sons of Visvamitra. 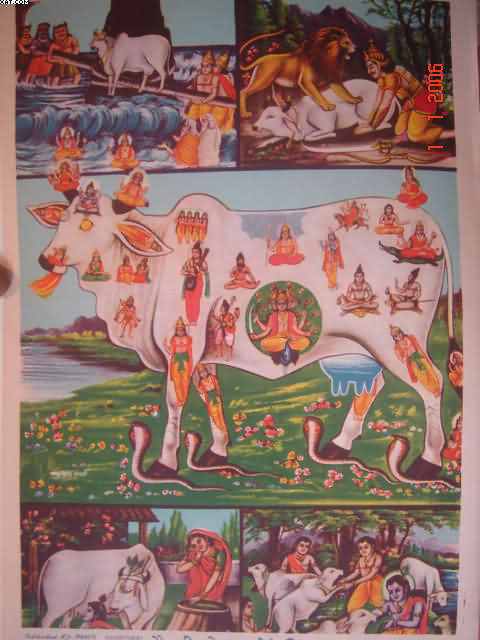 The calf of Kamadhenu was acquired by the sage Jamadagni after years of penance. It was coveted and stolen by the Haihaya king Kartavirya, which led to a wholesale massacre of kshattriyas by Jamadagni's son Parasurama. 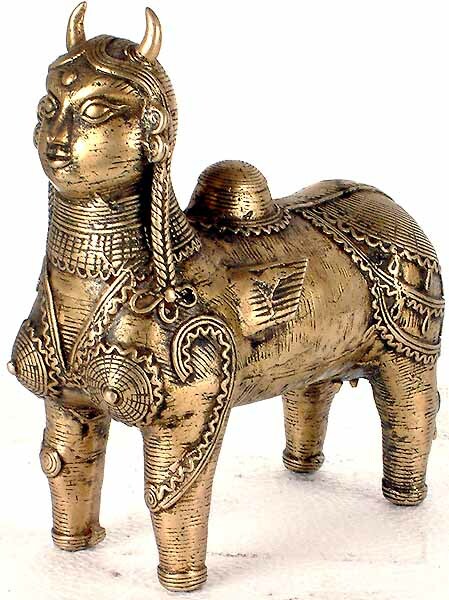 Kamadhenu is also called Surabhi (hence her descendants or worshippers are called Saurabheya); Kamadugha; Kamaduh; Savala and Nandini (this last name was also given to the daughter of Kamadhenu). 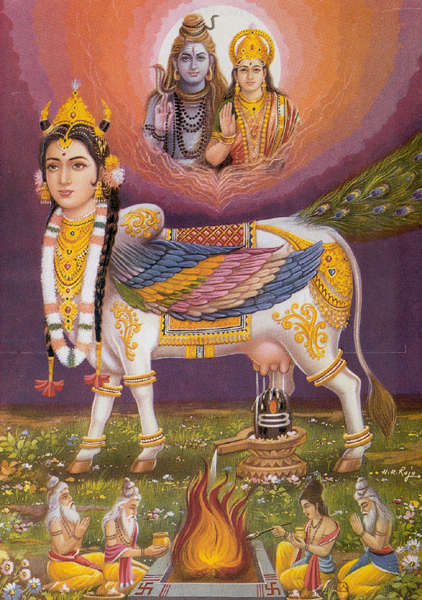 Kamadhenu's motherhood and nourishing attributes are emphasized through her twin breasts. 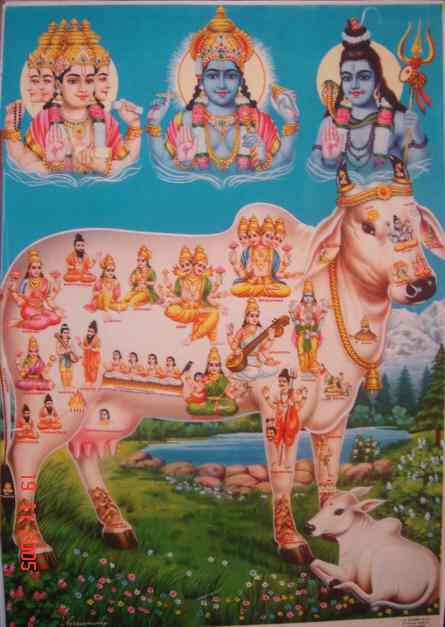 The Puranas declare "she is a goddess with marvellous powers and attainments who gives milk whenever needed by gods and sages," and that "all the cattle in the world today are descended from Kamadhenu"."